Linda Marie Herrera obituary. Carnes Funeral Home. On Wednesday March 19, 2014, Linda Marie Herrera was called home by the Lord. She was born in Galveston, Texas on April 3, 1955. Linda was a home health provider and she loved her grandchildren dearly. Linda is preceded in death by parents, Abelardo and Evangelina Garza; father-in-law, Benjamin Herrera Sr; grandson, Tre’von Miles and brother, Alfred Garza. Linda is survived by loving husband, Benjamin Herrera Jr., children, Christina Garza (Reggie Jackson), Abelardo Garza, Elizabeth Baker (Ronnie Rhem), Jose Garza (Iris Garza); grandchildren, Stephanie Garza –Martins (Jeremy), Ronald Bailey (Erica), Rolando Bailey, Roland Bailey (Jaleesa), De’Asia Tatum, Jada Rhem, Evangelina Garza, Jose Garza, DaeJone Tatum, Edward Franklin Jr., Kyndall Johnson, Kennden Baker, Antonio Garza; great-grandchildren, Tiannah Martins, Ronald Bailey Jr., Andrew Bailey, and Raija Bailey; sisters, Beatrice Garcia (Pete), Carolina Gonzalez, Cecilia Rivera, Angela Rivera (Gilbert); mother-in-law, Mrs. Benjamin Herrera Sr. and brother-in-law Salvador Rivera as well as a host of additional family and friends. 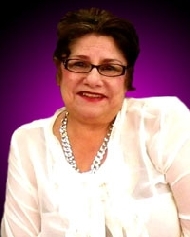 Guests are invited to share in the Celebration of Life Visitation for Linda M. Herrera from 5-7:00 p.m., with a 7:00 p.m. Memorial Service to follow on Thursday, March 27, 2014 at Carnes Funeral Home-Texas City, 3100 Gulf Freeway, Texas City, TX 77591. Funeral Services will follow on Friday at 11:00 a.m. at CrossPointe Community Church, 722 3rd Ave. North, Texas City, TX.